As we drove from Shangri-La towards Lijiang, the Tibetan style of houses gave way to those with Chinese temple style roofs. On the way we made a stop at the famous Tiger Leaping Gorge. 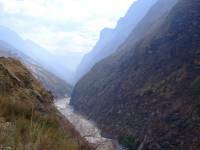 This is believed to be the deepest gorge in the world. There is a flight of steps to walk down to the gorge but you can see it from the top with stunning views of mountain landscape going far beyond. We arrived Lijiang & checked in 3* Grand hotel. This is a superbly located hotel right at the entrance of the historical ancient town. The hotel lobby is elegantly decorated & the rooms are very nice for a 3* hotel. From the balcony on the third floor you can see a the lovely roofscape of the old town. Entering the ancient town is an amazing experience. 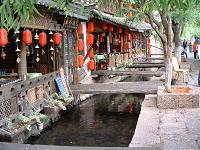 Walking through the gate is like going back several centuries with the lovely old Chinese houses along the old cobbled paths, wooden bridges crossing the many streams that are so clean, they are full of goldfish released by visitors for luck. 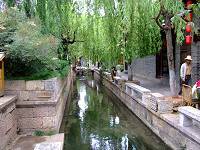 Willow trees stand next to wooden shuttered houses with Chinese red lantern by the doors. Although all the old houses are now shops & restaurants, the old town is still looking beautiful. 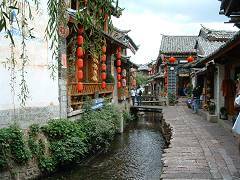 The local people are actually living in the ancient town. Most of them live behind their shop. 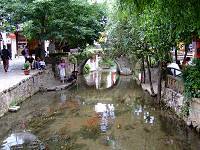 We saw a few women doing their washing by a stream running through the ancient town. 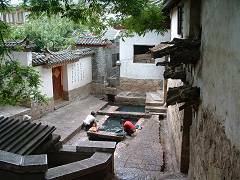 There is also a hospital here with hospital beds & patients inside the ancient Chinese houses. By night the whole area is lit with lamps and red lanterns, and alive with songs & music. The local Chinese girls sing (in Chinese) by their restaurant door to attract customers for their restaurant. This is quite an old custom and adds to the atmosphere. That night Tony took us to a beautiful old house that is now a Chinese restaurant for our dinner. 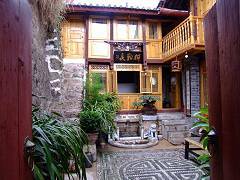 Like all Chinese houses we enter through an outer door, stepping into a large square courtyard. The beautiful courtyard with lovely pattern cobbles & pot plants is surrounded by dining rooms on all sides. Then I realised that the building is actually new, part of the town that has been redeveloped in the old style. Next morning we visited the famous Black Dragon Pool Park. 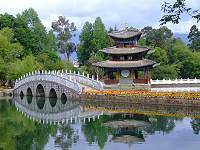 There is a famous photo that appears on every travel book, a white oriental bridge in front of the Chinese pagoda by a lake with the Jade Dragon Snow mountain in the background. This is the Black Dragon Pool. The park & the scenery are like a traditional Chinese painting come to life in front of you. The water of the lake is so still & reflects the whole image from above upside down. There is a small single pavilion standing in the middle of the lake. With the perfect reflection from the water, the pavilion is looking like flowing on glass. It is so magical. The park is quiet in the early morning with few local people enjoying & relaxing while there are some visitors like us admiring the beauty of the park. In the park there is a bandstand where local musicians play classic Chinese music. Unfortunately there is also a CD stall nearby playing loud music with occasional western pop song. It seemed an offence to destroy this peaceful, beautiful classic environment. If you like goldfish there are thousands in the lake. You can buy a small pot of fish food from an old Chinese man sitting by the lake. Once you walk to the edge of the water all sizes of goldfish appear for their food. It is a garden of heaven. 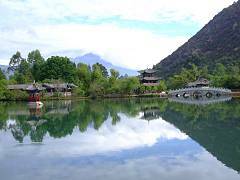 Before we left Lijiang for Dali we visited the only 5* hotel in town, the Quanfang hotel. It is a huge hotel with a very wide range of 5* hotel facilities. The best view of the city of Lijiang is from their revolving restaurant on the top floor. The view is stunning. We are using this hotel in our deluxe hotel category. 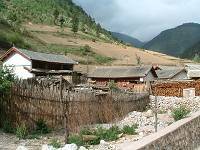 On the way to Dali we stopped at Baisha village. 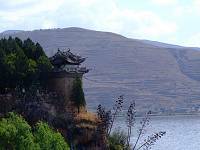 Before 1270 Baisha was the capital of the Naxi Kingdom. The whole village seems hardly to have changed since. 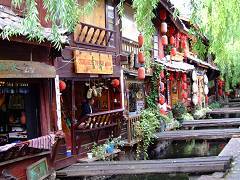 All the traditional old Chinese houses along the cobbled lanes are still looking like part of the ancient period except now that many are turned into shops for selling art & craft to visitors. There were 4 older men playing local Chinese musical instruments at the front door of one of the houses. It was a very pleasant walk about in this ancient village. We also visited an old Chinese grand family house, Yan Courtyard, dating back to the nineteenth century. This house was once a wealthy Chinese family's home but it is now a museum for visitors to see the grand house of that period. 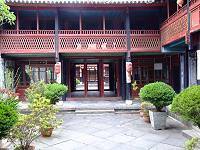 It is a classic Chinese house with many inner courtyard gardens & all the beautiful wooden structure of the building. 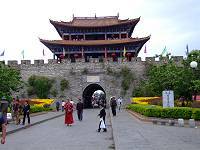 Like all traditional Chinese houses it is hidden behind a solid wall & an impressive tall gate. Just before we arrived at Dali we also went to the Three Pagodas. 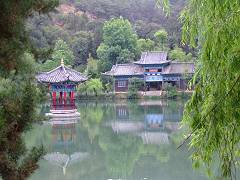 This is a very impressive temple complex with three pagodas standing on the hillside. They were originally erected in the mid-9th century. 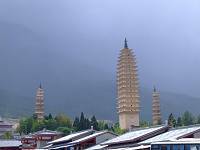 The tallest in the middle is 70m high and it is flanked by two smaller pagodas on either side at 42m high. We checked in at the 5* Regent hotel. As we expected, although it is a brand new hotel, the style is rather of the 1950's. We are going to use Landscape hotel as our both superior & deluxe hotels category in Dali. 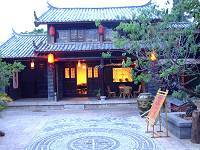 Landscape hotel is converted into a hotel from an old Chinese house and is situated in the ancient town. Although new additions has been made the original building & the architectural design of the beautiful courtyard & the rooms remain. It is beautiful & tranquil. Like the ancient town in Lijaing Dali ancient town is inside the wall of South gate & North gate. Both old towns have their different character & outlet. Dali old town is within the wall city while Lijaing old houses are group together among cobbled lanes & streams in a large area all the way up the hill. Next morning we boarded the local cruise ship for a 3 hour cruise on the Erhai Hu Lake. This is the seventh biggest freshwater lake in China covering 250sq km. It is a very pleasant journey with peaceful landscape & environment. The first stop after one hour sailing is a brief visit to the Lesser Putuo Temple on the Putuo Island. An hour later we stopped at a village for sightseeing & shops etc. During the cruise there was a special Chinese 3-course tea being served with music & dance performance in the theatre. This boat trip is very popular with the local Chinese tourists in large groups. We will be offering our client this trip but in a small private boat in future.